Although it may seem strange to many of us like to live or at least spend some time on the space station, not only because we like the space, but because in the scientific experiments in the end, have to prove with “defective” people to to see the rate of human survival in space. 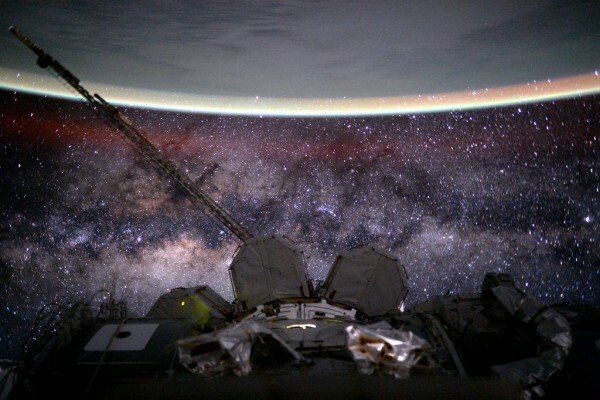 Obviously, who spend time there, he is obligated looking out the window to see spectacles of nature as the image: Milky Way (yes, you can see from Earth in dark nights) with our small planet. Remember that, for now, man has been one year at most, in orbit around the Earth in microgravity, which is not the same as zero gravity or gravity 0.